Visit Jade Bloom University to learn how we distill the highest grade, organic, wildcrafted from the best indigenous environments from around the world, 100% pure essential oils. Access The Official Oil Guide to learn how to safely dilute your essential oils and how to best use them. Please note, aroma and color of each batch of oil may differ slightly based on the soil and harvest time of the year. Have a batch number? You can locate it on the bottom of each bottle. Access the tests and certifications specific to your bottle of oil with our Batch # Lookup Tool. The Perfect Addition to your Beach Bag This Summer! Jade Bloom's Facial Spray with Aloe and Rosewater is just as hydrating as it is refreshing! The Aloe moisturizes and calms skin while the Rosewater minimizes rednesses and rejuvenates skin. The Rosewater is a non-GMO, steam distilled, pharmaceutical grade, and selectively sourced hydrosol. Its mild astringent properties help to tighten pores and gently tone skin, and it's so refreshing! The Aloe Vera Gel Juice is Cold Pressed, Non-GMO and Pharmaceutical Grade. It can be used topically to heal wounds, moisturize, kill bacteria, protect the skin and reduce inflammation. How to use: Mist face, neck, and hair for a quick refresher. This spray will hydrate your skin, and will not disturb make-up. -- Anti-aging properties reduce the appearance of fine lines and wrinkles. Minimalism is something we’re big advocates of here at Jade Bloom. For this reason, we try to create simple, yet effective alternatives to common products consumers utilize daily. From our toothpaste and deodorants to our lip balms and pomades, we’ve set the bar high in regards to quality and well-researched, simplistic ingredients lists. 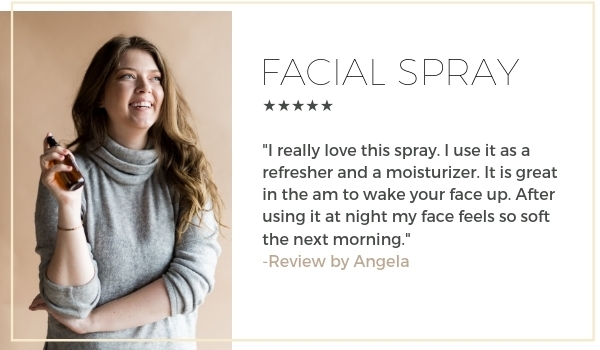 Our brand-new Facial Spray is no exception. Aloe. Rosewater. That’s it. Seriously. High quality Glass Bottle with our Convenient Spray Top Lid. This information is for educational purposes only, it is not intended to treat, cure, prevent or, diagnose any disease or condition. Nor is it intended to prescribe in any way. This information is for educational purposes only and may not be complete, nor may its data be accurate. Safety precautions: Extremely potent use with care. Consult a professional reference for correct dilution ratios prior to application. I absolutely love this!! Rose is one of my all time favorite scents and this spray feels amazing on my skin. I use it to moisturize my dry scalp in winter after a shower.Leaves my hair smelling great without the oiliness. I really love this spray. I use it as a refresher and a moisturizer. It is great in the am to wake your face up. After using it at night my face feels so soft the next morning. I absolutely love this product. I use it every morning under moisturizer. My acne scars are almost gone after using 1 bottle. I’m on my second and will use this forever, I hope! I started using it on other scars, will update on that progress in a few weeks. (Surgery scars) I highly encourage this product! I am not having new adult acne for the first time in forever, literally. You won’t be sorry for using this natural product! This stuff is amazing. I love it! Being in a dry climate, using it throughout the day is very refreshing. Not to mention, the smell reminds me of the rosewater lotion my grandmother used to use, meaning, the scent takes me back to happy childhood memories. I just got this & tried it out & I love it! It was recommended to me by Jacqueline when I had some questions online & she gave me a great item to try. Smells great & I really felt the refreshing moisture on my face & hair. (So did my kitty!) Looking forward to results after a week or more of use. Any suggestions on how often to use & when during the day? Love the way it makes my skin feel and the dewey look it leaves behind. I usually spritz after apply my foundation and it lasts all day. Amazing scent and an amazing product for my changing skin! Definitely noticed a difference since I started using this! Definitely recommend! I love this product! It makes my face feel so amazing! I bought this to spritz on my face for the smell. I'm 60 plus and discovered how great this product is by accident. I always moisturize etc., but during an emergency I only had time to wash and spritz my face. Hours later I looked at my skin and it was glowing. I won't do the no moisturizer again but it certainly speaks for this product. This spray is very refreshing I spray on my face and hair first thing in the morning and at night. I'm not a huge floral fan but hope to get use to the rose smell. I love this spray. It's refreshing and smells great. It also helps set my mascara which I love! I love this spray! I like it so much I add a bottle to almost every gift I give to a female. It tightens and smooths my skin and just feels so refreshing. I use it morning and night on my face and neck and chest and my skin seems softer and smoother. If I could only have one thing from Jade Bloom, it would be this product! I actually purchase this for my Golden Retriever. He has so many seasonal allergies that we want the winter freeze to happen! LOL! I have been spraying this on him wherever he starts to scratch and it has been helping. I am waiting for a bigger improvement but am very pleased thus far. I'm in love with this product i wish it came in a bigger bottle. Great product. Genius combination, not sticky, great for hair and skin. Even used it on the puppy's dry skin problem! I keep my facial spray in the refrigerator and spray on my face after I wash my face in the morning. awwwwwww feels so good! I loved this for the first few days, but unfortunately developed a sensitivity to it. Maybe instead of using every day, will try once a week. It was very moisturizing and softening. I got this product for my daughter, she loves it! I love this spray! I have super oily skin, acne prone, huge pores, and have a hard time with facial products but this has worked wonders for me! I must admit I am not a HUGE fan of the smell of rose (other than smelling a real live rose) but the smell of this spray is nice and it fades fast enough that it does not bother my sensitive sniffer. It has really helped with oil control and just making my skin feel great! Makes my skin feel amazing! I use it at night and it makes my face smoother and I live the smell of rose. will have to buy more! It's simply refreshing and smells great! I wish my skin loved it! But when I used it my face burned and broke out into a rash. I use the Rose Water and never had a bad reaction using that. Too bad my skin didn't like it! But over all love Jade Bloom products. I've never had a bad reaction to their stuff before. I love the rose smell. I just wish the scent lingered longer. I just ordered the rose EO and I am eager to receive it to see if the scent is a little stronger and longer lasting. I love the way this spray feels on your face. It cools you down and makes your face feel hydrated. I have very dry skin and this seems to be helping. Currently I have dry patches near my nose and when I spray this it seems to keep it from feeling dry and rough. I would recommend this product. I love using this throughout the day, I put it in my bag when I am away from home. It is a great way to quickly cool down. It really moisturizers the skin. I even spray my arms with it! In my opinion, this product is a must have! Absolutely love this product for instant hydration on my face, neck and chest, especially now because I'm outside in the sun alot. It feels amazing! I added this to finish off my order. It's a very nice, refreshing spray. Love the rose fragrance and what rose does for my skin. This spray is amazing. It feels refreshing and then when it dropped my skin feels soft. This is a must have. This spray is wonderful on the skin...just the right balance- so simple..nothing harsh on the skin. I used it every day and keep it in my purse to freshen up. I have been using the rosewater as a toner for several months so wanted to try this since I know aloe is good for the skin. This didn't disappoint. So refreshing and my skin feels amazing, toning but not drying. I purchased this knowing I needed it and would love it, but it surpassed all expectations. I keep it refrigerated. Great after cleansing my face, and as a refreshing pick me up at any time. Very refreshing and lovely scent. I always spray my face, neck, and even hair before putting on makeup or after a shower. I am so glad to have this. i use it in the morning before make up and before bed. i have stopped using moisture creams on my face and just use this. Jadeblooms 'Aloe Vera & Rose Water Facial Spray' is the best product I've ever used in my 32 years. I've always suffered from acne, so needless to say my pores don't look the best. Let's face it, we all get older so our skin gets wrinkly and loses it's elasticity. I've tried every product you can think of to help these pesky inevitable problems and nothing has ever impressed me or made a dent in anything but my bank account. That was until about two weeks ago when I got FREE products, for taking some very intriguing and educational courses on natural oils. One of the products I ordered was the Aloe vera & Rose water Facial Spray and it's miraculous to say the least! The smell is a rose garden heaven with the feeling of a perfect cool, soothing mist on your skin. My acne is non existent and my pores are normal. The scars from my acne are almost completely gone and my face looks five years younger. I couldn't wish for a better product. The added benefits from using a natural product and saving tons of money couldn't make me more satisfied. I will never use another product on my skin again. Thank you so much Jadebloom!!!! This will only last a month! It's THAT wonderful! Love this! It is great as a cool down in the hot weather, great for hot flashes, great as a skin toner! Please make a larger size!! I love the rosewater facial spray! heavenly fragrance, subtle and clean. It's such a great price that I feel free to use it as many times a day as I would like. Smells great and is really refreshing and soothing. Nice pick-me-up in warm weather. Will buy again. Really Refreshing for Hot Summer Days! I purchased 3 of these for myself and family. The bottle tucks nicely into my purse. 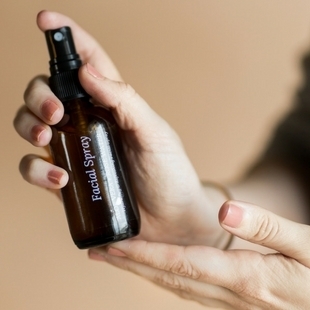 When I'm errand running and climbing in and out of my car on a hot Texas summer day the spray feels wonderfully refreshing. It's also great out by the pool or at the kids' sports... just keep it in the cooler with the drinks and spritz away! Smells divine! A very soothing spray. I have roasacea and it helps to cool. I really like this spray on my face - my chest area did not like it - the gave me a rash. I don't know why it reacted to the skin on my chest that way, but I continue to use it on my face. I have not used this product long enough to know the long term effects however as soon as I put this on my face my stress level went from 5 to 0 and my skin felt amazing. I love JadeBloom. Jade Bloom exists to change the way people think about their health.